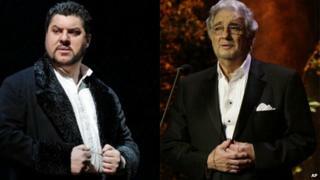 Baritone Luca Salsi found himself in a race to fill Placido Domingo's shoes at New York's Metropolitan Opera on Saturday afternoon. The Italian singer was given just 30 minutes to reach the venue and take the stage when Domingo succumbed to a cold. He had no chance to review the score before his performance in Verdi's Ernani, which went out live on radio. The 40-year-old had last sung the role in Rome in December 2013, with conductor Riccardo Muti. "When you do something with maestro Muti, after you will remember very well the score," Salsi said afterwards. He went on to play Enrico in the evening performance of Lucia di Lammermoor, becoming one of only a handful of artists to sing two leading roles in one day. Recalling the seat-of-your-pants events of Saturday, Salsi said he was walking around Broadway with his wife when he received a call from Domingo's son, Alvaro. "Daddy doesn't feel very well," he remembered hearing. Luckily, he was just nine blocks away from the venue, allowing him to get into costume and have a brief chat with music director James Levine before walking on stage as Don Carlo. "I didn't have the time to think and be nervous," he said. "Just go and sing." Domingo stood in the wings during the performance to offer encouragement to the performer, who had never been on the set before. "I had to improvise everything," Salsi said. According to the Associated Press, the baritone smiled broadly during the curtain call, when the cast were showered with flowers by the audience. Domingo later tweeted his thanks to the singer, accompanied with a photo of the pair backstage. The performance is due to be broadcast by BBC Radio 3 on Monday, 6 April.